The round ring style of lanyards can be used as wrist wear or some other different application, like carry small meter, palm device, keychain holder, fastener and more. The great designed ring style lanyards come with 1/8", 3/8", 5/8", 3/4" and 1" diameter or width of round cord or flat straps or bands. They come with nylon cord, elastic cord, steel wire cable, cotton straps, nylon straps or polyester straps bands or webbing. Depending on the feature of cords or straps, they can be clamping on by metal coupler or sewn-on. Most of smaller size of cords, straps or steel wire cable are clamped on by metal coupler. Larger size of flat straps or webbing are sewn-on. Still have a large selection of web bracelet, wristband, wrist straps, bands, or rings are not listed yet! If you didn't find the right hardware for you, just email us the detail specification and picture, then our R&D department will find the most match one for you. Any custom size, length, material, hardware attachment, custom logo and custom imprint are welcome! 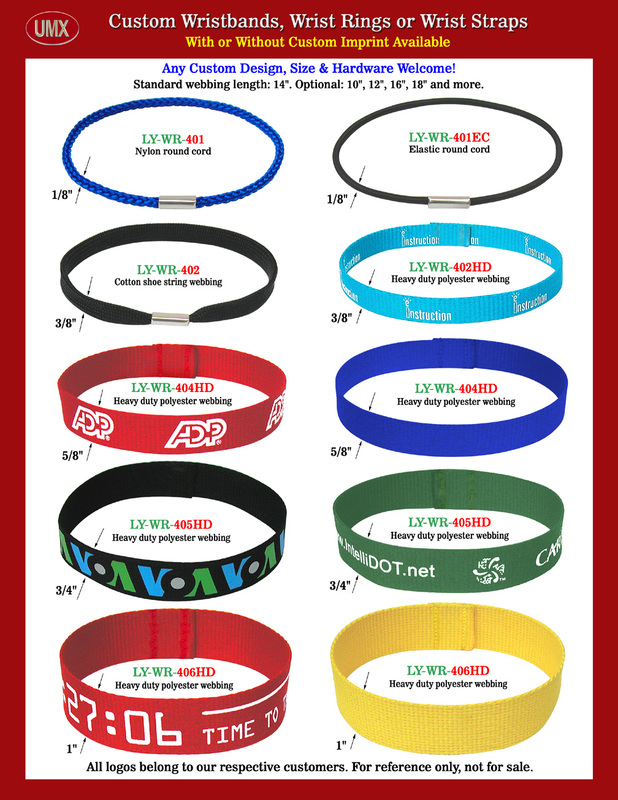 You are viewing Lanyards > Leash > Wristbands or Wrist Straps > A General Introduction To Round O-Ring Style Web Wristband, Wrist Band or Wrist Strap Lanyards.